What is tube filling and cartoning? Tube filling is usually reserved for liquid filling of varying viscosity. The types of products most commonly used for tube filling are lotions, creams, scrubs, masks, gels and paste. Cartoning is generally used in conjunction with tube filling. 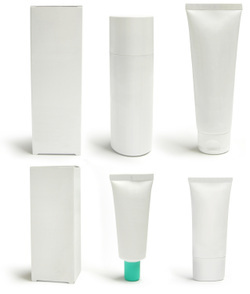 The display packaging for tubes or bottles in cartons. The cartons are produced from coated paper or paperboard cardboard. Cartoning may be used as an end service for tube filling. Cartons vary in shape, color, size, texture and structure. Their usage varies from industry to industry. Tubes are filled from the back end. Tubes are first put into a machine, sanitized, oriented, labeled, filled, heated for a seal crimp and finally, lot coded. The excess waste is cut off from the tube and it exits the chute, where it’s tested for leaks. After inspection, the tubes are packaged away. What are the advantages of tube filling and cartoning in packaging? Ideal for health and beauty products. Health and beauty products are often filled in tubes for easy customer handling. Great for packaging liquids, thick or thin. Because of its varying material, tubes can release thin or thick product with ease. We can fill from one-half of an ounce up to 10 oz. We can fill product at varying viscosity; i.e., paste, cream, lotion and more. We can lot code on the crimp or end of the tubes. This is often a standard procedure. We can cut the stringy leaks formed from withdrawing the fill for capping. We can use laminate (aluminum outside, polyethylene inside) for tubing material. We can use high and low density polyethylene for tubing material. We can seal aluminum tubes with single, triple “saddle” or double seals. We can use aluminum for tubing material. We can use mylar for tubing material. We can do different styles of crimps. We can create several variations of auto-bottom tuck tops for quick assembly. Please note that custom tooling is required for every machine automated carton. All of the above cartons can be done manually.